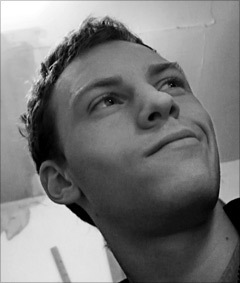 Extralogical consists of articles and code by Benedict Eastaugh, a writer, programmer and erstwhile philosophy student. Arriving on this planet in the same year as Blade Runner , Benedict’s days are spent contemplating the world and its inhabitants—usually in the pub. His philosophical interests lie in formal logic and formal approaches to philosophy; foundational questions in the philosophy of mathematics; and the philosophy of mind and perception. He maintains an interest in Taoist thought and the works of J.G. Ballard, and suffers from an irrational obsession with notebooks. Extralogical is powered by WordPress and lives on Slicehost. The current theme sprang from Tarski like Athena from the head of Zeus; images of older versions can be seen in this Flickr set. Your every move through this site is tracked with Mint. Thanks are due to Eric, for all his advice over the years; to Chris, Stuart and Peter for fielding stupid programming questions; and to Alex for being the best server admin a man could hope for. Lastly, John Allison, without whom the world would be a less colourful place.